Where seen? 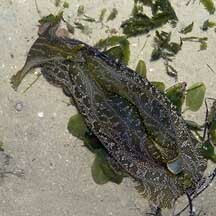 This chubby delicately patterned sea hare is seasonally common on our Northern shores, among seagrasses. Sometimes large numbers are seen, at other times, not at all. It is also known as Paraplysia geographica. Features: 8-12cm. Body large, heavy and smooth. 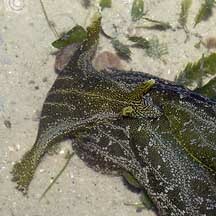 With two pairs of tentacles: one pair of oral tentacles forming flap at the front of the body. 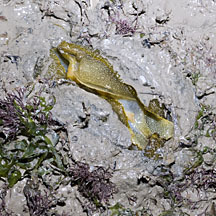 When compared with sea hares of the genus Aplysia, sea hares of the genus Syphonota have relatively small rhinophores which are close together and situated further back from the head almost between the long 'wings' or parapodia. When submerged, these wings are held high. It is said that they can swim with their parapodia. 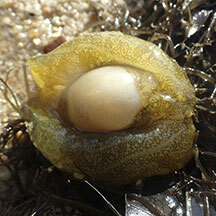 Usually olive or yellowish greenish with tiny white spots forming patterns of stripes. 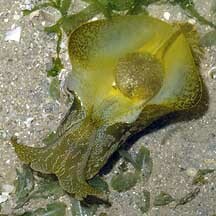 Often found half buried in the sand, but sometimes crawling in the open, especially near sunrise or at night. 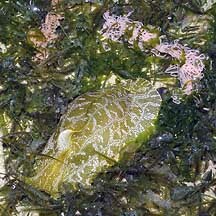 It lays long tangles of pink egg strings among seaweeds and seagrasses. What does it eat? 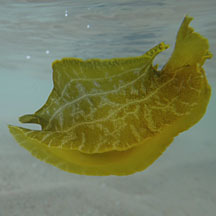 It is believed to feed on brown seaweeds, but in our observations, these animals seem more abundant during blooms of the green sea lettuce seaweed (Ulva sp.). Photo shared by Ywee Chieh on facebook.